The Norway rat has many names. It is often referred to as the brown rat, common rat, sewer rat, Hanover rat, Norway rat, Brown Norway rat, Norwegian rat, or wharf rat. Rats have coarse fur that is usually dark grey or brown on the backside and light grey or brown on the underside. Rats can grow up to 10 inches (25 cm) in body length. The tail is usually the same length as the body and can be pink or brown in color, but the tail always lacks fur. Adult males typically weigh about 1.25 lbs. (~19 oz. ), and females weigh 0.75 lbs (~12 oz.). Very large individuals can reach 2 lbs. If the animal is larger than that, it is most likely another type of rodent such as a muskrat; muskrats have frequently been mistaken for Norway rats. Rats reach about 16 inches long, nose to tail tip (with a body of about 9.5 inches), and weigh about one pound. A Norway rat has a blunt nose and small close-set bald ears. Its tail is fatter at base, cylindrical, scaly, semi-naked, shorter than the body, and pink or tan in color. The muskrat (Ondatra zibethica) is native to Alaska and common everywhere except north of the Brooks Range. The muskrat can be distinguished from a rat by the muskrat’s larger overall weight (2–4 pounds) and size (10–14 inch body size, plus 8–11 inch tail), and by the character of the muskrat’s unique tail -- which is long, black, naked and flattened from side to side like a rudder. Preferred habitats for muskrat include marshes, and edges of ponds, lakes, and streams. Muskrats are chiefly aquatic, but do move overland, especially in the autumn. Unlike rats, or squirrels (which have a long bushy tail), they are not known to dwell within human habitations. The Norway rat is usually nocturnal. It is a good swimmer, but unlike the related Black rat (Rattus rattus), it is a poor climber. Norway rats dig well, and often excavate extensive burrow systems. Rats are capable of producing ultrasonic vocalizations both as adults and pups. 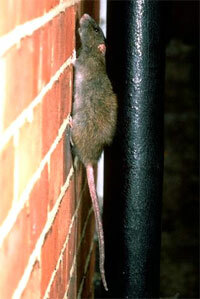 They may also emit short, high frequency, socially-induced vocalization during interactions with other rats or animals. This call most resembles a “chirping” sound, but is undetectable to human ears. Rats can audibly be heard through calls resembling “squeaks” when they are in distress. Rats are omnivores. This means they can prey on both plants and animals. As predators, rats are very opportunistic. The Norway rat can breed throughout the year if conditions are suitable, and a female can produce up to twelve litters in a year. The gestation period is only 21 days, and litters can number up to fourteen, although smaller litters are more common. Therefore, rat populations can grow very quickly. Rats have a maximum lifespan of about three years, but typically live less than one year. Norway rats live in large hierarchical groups, either in burrows or subsurface places such as sewers and cellars. When food is in short supply, the rats lower in social order are the first to die. If a large fraction of a rat population is exterminated from an area, the remaining rats will increase their reproductive rate, and quickly restore the old population level. This makes it important to have a well thought out and aggressive eradication and prevention plan, one that does not leave any survivors and also does not allow recolonization from elsewhere.